Aside from the golf clubs and golf balls you use, the most important piece of equipment you need is a high quality golf bag. While not all golf bags share the same style, having a golf bag that meets your specific needs makes it easier to enjoy your round and play better golf. Why does a golf bag make such a big difference? What if you like to carry your clubs during your round and you have a stand bag with legs that aren’t always reliable? Or how about a cart bag that doesn’t provide enough pockets to keep your stuff organized? Although many of these concepts may seem trivial, taking the time to find the best golf bags for your game will allow you to focus fully on your round. 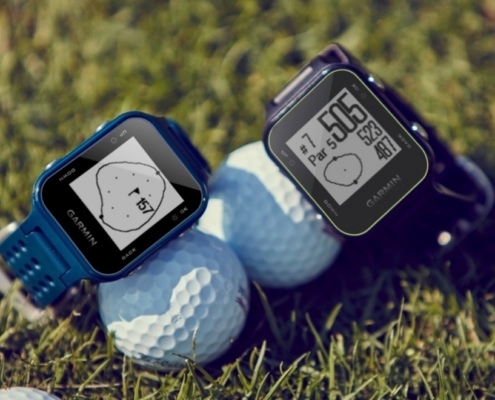 Check out any online retailer or even your local golf shop, and you’ll quickly see how many different options you have to choose from. It’s our goal to provide you with the best up-to-date information so when you want to find your next golf bag, you can take a lot of the guesswork from your purchase decision. What do the best golf bags have in common? Although the style of golf bag can vary, there are certain characteristics you should be on the lookout for to ensure it is a high-quality product that will last for many golf seasons to come. Here are a few of those characteristics. This may seem obvious, and there may be great golf bags made by obscure manufacturers, but your best bet is to find golf bags that are well-known and have been trusted by golfers for years. These brands include Ogio, Sun Mountain, Ping, and Titleist. Even if you are just carrying your clubs from the trunk to the golf cart, it’s incredibly important that the straps on your golf bag feel good on your shoulders. If you happen to carry your clubs, the need for a sturdy yet comfortable carrying strap is even more vital. Every component of a golf bag should be of the highest quality. Nothing can ruin a golfer’s day faster than a hole in one of the pockets or a strap that starts to wear out after less than a couple years. Don’t settle for a mediocre golf bag. How Big is a Golf Bag? Depending on the model and design, golf bags vary widely in size. 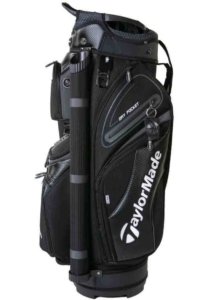 The biggest golf bags, specifically designed for golf professionals and instructors, weigh up to 12 pounds and feature 10 or more pockets, 9-10 inch top size, and can hold a full set of golf clubs along with training aids. On the smaller side of the spectrum, Sunday golf bags weigh less than three pounds, can usually hold 14 clubs, and feature enough pockets to hold golf balls, tees, and ball markers. What are the different types of golf bags? Generally speaking, there are four types of golf bags: Tour Staff Golf Bags, Cart Golf Bags, Stand Golf Bags, and Sunday Golf Bags. Having a solid understanding of each golf bag will help you understand which bag (or bags) is right for you and your golf game. Anyone who watches golf on TV will see a Tour Staff bag being used by the best golfers in the world. However, the golf bags they use are not exclusive to professional golfers; you can own one too! Tour Staff Bag manufacturers offer embroidering, which gives you the option of having your name on your golf bag. These golf bags provide a professional look, and can be customized with a company logo. Staff Bags provide plenty of room for everything you could need, especially on rainy days where you need a full rain suit, an extra pair of golf shoes, etc. Even though some Tour Staff Golf Bags offer dual strap models, these bags can still be very heavy and not conducive to carrying around the golf course. The protruding front pockets make them awkward to sit on a pull or push cart, which limits a Staff Bag to just sitting on a cart. As the name suggests, these golf bags are specifically designed for being attached to a golf cart. The best golf cart bags feature a cart strap loop, which allows you to securely fasten the bag into the back of the golf cart, along with ample space for golf clubs and several useful pockets. This golf bag is designed perfectly for golfers who only ride in golf carts or use a pull cart. Despite it’s larger size compared to a stand bag, cart bags are lightweight and don’t take up too much space in the backseat or trunk. A cart bag does not work very well for carrying around the golf course, which limits its use, especially for international golf travel where golf carts may not be permitted. Even the best cart bags can be a bit extreme in the number of pockets it offers, as too many pockets can make it difficult to keep track of where you’ve placed things. Check Out Our Top 10 Golf Stand Bags Reviewed. Lightweight and with stand legs that keep your golf bag upright, these bags are by far the most popular for players who prefer to walk and carry their golf bags. The best Stand Golf Bags feature strong legs that expand and collapse consistently, comfortable dual straps, six dividers to keep your clubs organized, and enough pockets to carry a full set of clubs, water bottles, umbrellas, golf balls, tees, and rain gear. Not only are these bags great for the golf course, they also allow golfers to keep their clubs upright on their own when they’re on the driving range or the chipping/putting green, something you can’t do with a staff or cart bag. Takes up much less space than a cart or staff bag, which makes it easy for a foursome’s worth of stand bags to fit in most car trunks. The base and legs of a stand bag make it awkward to place on a pull/push cart. More prone to damage, particularly in regards to the legs and base mechanism. Whether they’re called a Carry Golf Bag or a Sunday Golf Bag, these golf bags are the lightest and smallest golf bags available. The vast majority of carry bags can hold a full set of clubs, but its best benefit is carrying just a few golf clubs for practice. Sunday Golf Bags are not only incredibly light, they take up very little space, which means it can sit in your trunk and be easily accessible for late practice sessions. Some Carry Golf Bags also include legs, but even the ones that don’t are easy to pick up off the ground and keep carrying. Limited storage space for your golf accessories, such as tees and golf balls. The bags with stand legs are susceptible to being blown over in heavy winds. Golf bags for women share the same functionality and features that other golf bags possess, with three minor differences: they are slightly lighter, shorter, and can be found in a wide variety of different colors. Women who love golf and love expressing their fashion sense through their golf equipment will love having a ladies golf bag. Check Out Our Top 10 Womens Golf Bags Reviewed. What is the lightest golf bag? Typically, Sunday and Carry bags are the lightest, followed by Stand Bags, Cart Bags, and finally Staff Bags. 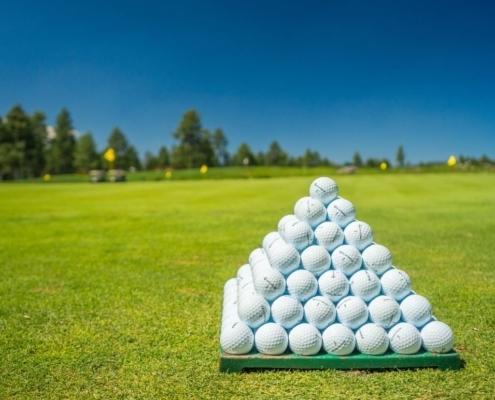 Golf bags range in weight from 2.5 pounds up to 12 pounds, and the contents in each bag can make certain bags weigh over 40 pounds, so lighter is always better. 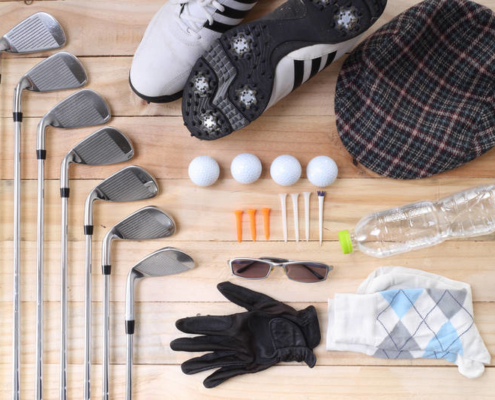 Which Golf Bag is Right for You? Now that you’ve gotten an idea of what different types of golf bags are available, which one is right for your golf game? That depends on several factors, and you may need more than one golf bag. 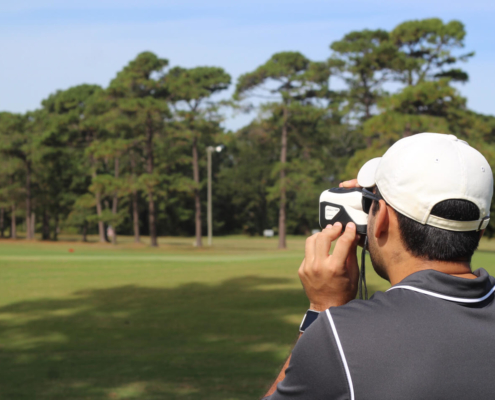 Not all golf courses are regulation length, 18-hole golf courses, and the type of golf course(s) you play has the biggest impact on what type of golf bag you need. For example, it wouldn’t make sense to have a tour staff bag with a full set of golf clubs if your home club is a 9-hole executive course. Sunday golf bags are perfect for just about every non-regulation golf courses: par-3 courses, executive length golf courses, 9-hole courses, and everything in between. 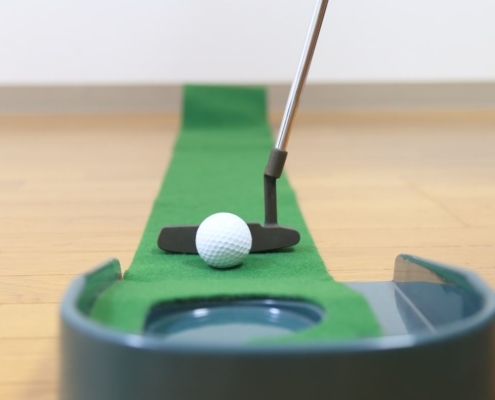 Sunday golf bags are also great for short game practice. If you’re new to golf, and not sure how much walking you’ll be doing on the golf course, then a stand bag makes the most sense. It can still fit comfortably in a golf cart, allowing you the easy option to ride or walk depending on how you feel and how walkable the golf course is. There are some golf courses out there that don’t allow walking, and if you play most of your golf at a course like this, then the cart golf bag or staff bag is the only logical choice. Having a stand or Sunday bag handy would be a good idea should you play another course that allows walking. Professionals and serious tournament players who want to look their best should have a staff bag and stand bag. Some tournament golf courses can be incredibly difficult to walk, even for a caddy, so having a stand bag will help lighten the load a bit. We certainly hope this guide gives you an idea of how to choose the best golf bag for you. This article is designed to help you sift through all the information regarding the different types of golf bags, the pros and cons of each, and which one is right for you. 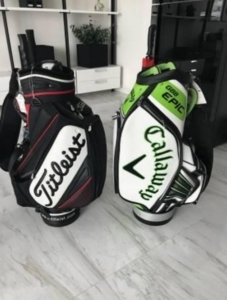 Here are some key things to remember: only buy golf bags from reputable manufacturers, make sure they are made with high-quality materials, and make sure the straps fit you and your shoulders comfortably. Testing the golf bag is important and can save you the hassle of returns later. Cart bags and stand bags are by far the most common types of golf bags golfers use, but Sunday or carry bags work great for shorter courses or practice sessions. Having two different types of golf bags make it easier to handle different courses and conditions. Men’s golf bags and Women’s golf bags don’t differ much, but even the slightest difference in height or functionality can make all the difference in the world for golfers. Follow these basic guidelines and we are confident that your next golf bag will be the best one you’ve ever had! Check Out Our Top 10 Golf Travel Bags Of 2019.